Mornington Peninsula Brewery was one of the earlier movers when it came to putting a New England style IPA through its brewhouse. It came in the shape of Jiffy Squid, initially brewed with Brisbane's Brewski for part of the bar's Pint of Origin Victoria showcase at Brewsvegas 2017 before returning as part of the brewery's #tinnage limited release can series. The beer ticked the key boxes for the style and won over many fans yet it wasn't one to wow us here at Crafty Towers, particularly compared to many of the brewery's scores of other beers. If we were to try to put a finger (or tentacle) on why, it was that the beer seemed to lack a bit of spark, a bit of punch, the sort of textural pizzazz that can make NEIPAs so enjoyable. 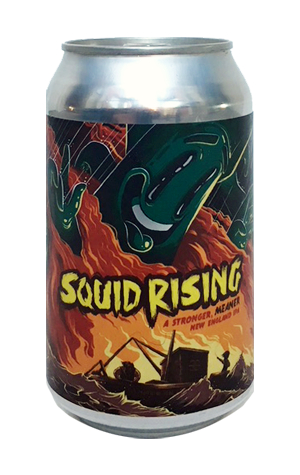 Which brings us to Squid Rising, a "stronger, meaner" version of the beer and one that comes with spark, punch and textural pizzazz aplenty. Personal experience to date suggests such beers work better when they've got a bit more booze in them, adding weight and, perhaps, compensating for the lack of bitterness, and here there's a pleasing intensity on the palate – and some of that brekkie juice like prickle on the tongue too – accompanying the cloud of tropical, citrus and stone fruit aromas and flavours. As an aside, the artwork on the cans is reminiscent of the final few pages of The Platinum Collection hardback book for Disney's The Little Mermaid, specifically the point at which Ursula is making her final attempt to kill Ariel's beloved Prince Eric. But we suspect you knew that anyway.